It's been a forgettable October and November for the Flames. Calgary's 8-14-2 record to begin December leaves them tied with Edmonton for the lowest point total in the NHL. However, after losing 3-0 to Toronto on Monday, the Oilers have a secure grasp on last place (yet again) thanks to having played one additional game. They also have one fewer regulation/overtime win, which is the first standings tie-breaker. Meanwhile, Arizona (13-9-1) occupies third place and the last playoff spot in the Pacific Division. The impressive Coyotes are on pace for 96 points. To get to 96 points by season's end, the Flames would have to go a ridiculous 37-17-4 over their final 58 games. Good luck with that. 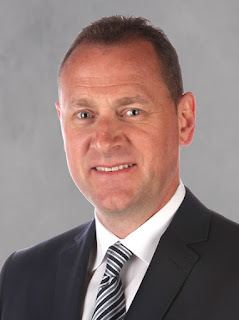 Considering general manager Brad Treliving spent the summer upgrading a roster that made the second round of the Stanley Cup playoffs last year, my first inclination is to say I can't imagine a worse start for the Flames. Except, I can. Their record could easily be worse right now. Remember, we're talking about a team that has a 5-1 record in overtime. This is also a team that beat Edmonton in regulation on a fluke goal scored from behind the goal line with nine seconds remaining. If they had gone 3-3 in OT instead and Cam Talbot doesn't give up that awful goal to Michael Frolik, they'd be at least three points back of the Oilers right now. The Flames have three regulation wins in 24 games. Three! The Penguins, Devils and that aforementioned Edmonton great escape. Yikes. Meanwhile, Calgary's first opponent of December -- Tuesday night at the Scotiabank Saddledome -- is the high-flying Dallas Stars, who lead the NHL with 19 wins -- 15 of them in regulation. Dallas (19-5-0) owns the NHL's best record, percentage points ahead of Montreal (18-4-3). Jamie Benn (18-17-35), Tyler Seguin (13-21-34) and revelation John Klingberg (5-22-27) are all top five in NHL scoring for a Stars team that has scored 84 goals, which is second only to the Montreal Canadiens (87). It's going to be a monumental task for the Flames to start off this five-game homestand on a winning note. But before we look forward, it's time to look back. How did Calgary sink to the depths they find themselves today? Here are eight categories in which Calgary ranks either last or second-last in the NHL. Each helps paint the picture as to why the Flames have struggled so badly to begin the year. The Flames have scored first 14 times, which is tied for seventh in the league. Good thing they've been very good at getting that first goal because when they give up the first one, it's pretty much been game over. Nobody has a worse winning percentage than Calgary, which is at exactly .100. The massive drop-off from last year's winning percentage of .435 in the same scenario points to a team that struggles to overcome early adversity. Falling behind 1-0 is hardly a death sentence, but it's sure having that impact on the Flames. As well, that third period comeback magic from a year ago? That has vanished. This speaks directly to the Flames goaltenders and their inability to steal the team a hockey game and that's something every team needs from time to time. Now the ultimate example of a steal would be Jonas Hiller last October when the Flames won 2-1 in Chicago despite being outshot 50-18. But it doesn't have to be that extreme. This year, even if Calgary is only outshot by one or two shots, they're still not getting any wins. Calgary's .077 winning percentage in this scenario is a long way back of 29th place Philadelphia (3-7-4, .214). Interestingly, Dallas is No. 1 at a perfect 11-0-0 when outshot. Kari Lehtonen and Antti Niemi are getting it done, supported of course by the Stars lethal offence. Minus 31. Yuck. But for fans, I doubt that number comes as a surprise. If this was The Weather Network, we could add in, "Feels like minus 50." Even without the windchill, that number is downright frightening. Consider that the Oilers are 16 goals better at minus-15. Calgary and Edmonton may have identical records but the Flames are getting blown out and the Oilers have been losing a lot of close games. It's a lot easier to turn one-goal losses into victories than three-goal losses. Ponder this. Nine times already Calgary has lost by three-or-more goals, something they did only 11 times all of last season. Calgary has demonstrated that they're really proficient at 3-on-3. However, that's an overtime gimmick unique to the regular season. For long-term success, they're going to need to get a lot better at defending at five-on-five because in case you haven't noticed, that's where a vast majority of games are played at. The Flames are one of only two teams to give up 50 or more goals (Edmonton, 54) at five-on-five and and it speaks to Calgary's poor defensive play all season combined with its mediocre goaltending. This isn't the old days. There aren't eight or nine goals in a game anymore. The average is a lot closer to five. A key to winning in this era is execution on special teams. It's imperative that teams take advantage of their power plays when they get them as it can be tough slogging out there at five-on-five. An efficient PP can give a team a big goal early that gives them the lead and puts them in control. It can also help get a team a crucial tying goal late in the game to turn a game around. Calgary has scored just once in its last 22 power plays going back to November 12. On the season, only the Carolina Hurricanes (12.5%) have been worse. That's just not good enough. Last year the Flames weren't great on the PK. At just over 80 percent, they were essentially in the bottom third of the league. Yet, if Calgary could have killed off penalties this year even at that rate of effectiveness, that would have resulted in six fewer PP goals against so far and depending what circumstances those came in, a portion likely would have been momentum-altering and result-altering. Think about the game in Anaheim last Tuesday. Flames led 2-0 when the Ducks score on the power play to get back into the game. Then tied 3-3 in the third, Anaheim scores the game-winning goal on the man advantage. In the last 10 games, Calgary is 12-for-21, an abysmal 57.1 percent. The only so-called convincing victory this season was against Pittsburgh, which was a 5-2 final and that was including an empty net goal by Johnny Gaudreau. Nobody else in the NHL has less than three wins of a margin of two-or-more goals. This points to a team lacking killer instinct and that ability when they take the lead to step on a team's throat and put them away. Proof is this confounding stat. The Flames have taken a lead in a game 20 times this season and they've blown that lead 17 times. Only three times have they hung onto the lead for the remainder of the game -- and again, one was that game in Edmonton where they only had to hang on for nine seconds. Trying to eek out wins every single night is no recipe for sustainable success as we've seen all season. It's been the talking point all season with the luxury of having three good goalies quickly morphing into the burden of having three bad goalies. Lately, Karri Ramo experienced a resurgence with improved play over 12 straight starts improving his save percentage from .868 to .899. However, that still leaves him 39th among 46 goalies, who have enough playing time to qualify. The worst offender has been Jonas Hiller, who ranks dead last with an .856 and he's way, way back of the pack. You may want to cover your eyes for this listing of the NHL's bottom eight as of the end of November. That's a whole lot of statistical ugliness and most concerning for the organization is it covers almost all aspects of the game. This team doesn't need to work only on one or two areas, they need to get better everywhere and fast if they are clinging even to the faintest hope that they can get back into playoff contention. More practically if things don't take a turn for the better immediately, the next statistic fans are going to start dwelling over are the NHL Draft Lottery percentages. For those already with their eyes affixed on the much-hyped Auston Matthews, let me add in this cruel little reminder that while the 30th place team does have the best odds of winning the lottery (20 percent), there's also an 80 percent chance that another team wins it and jumps to first pick. Plus this year with the new lottery rules kicking in, the first three picks in the draft all be determined via lottery so the last place team could drop as far down as fourth pick. So that's bound to result in plenty of angst, but we'll save that for another day. With a pile of unrestricted free agents (Hiller, Ramo, Jiri Hudler, Kris Russell, David Jones), the more pressing discussion is what happens with them with the volume on that debate sharply increasing if Calgary continues to stumble on home ice over the next couple weeks. Who knows, maybe the next time we look at some stats, it will be the odds of each of those UFAs being in a Flames uniform beyond the trade deadline. Depending on where you're at, some of you may look at that as finally a dose of good news. Is Markus Granlund turning into the Flames next Marty St. Louis? The way he's being utilized so far, it's sure starting to look that way. In one of the most famous player-that-got-away stories in team history, St. Louis was a Flames prospect in the late 90s. He was an offensive star in the minors but whenever he would get called up by Calgary, coach Brian Sutter would usually deploy him on the fourth line with limited ice time and his offensive totals would dry up. You want to stifle the creativity of a highly skilled player? Miscast him by consistently playing him with linemates like Bill Lindsay, Dave Roche, Steve Dubinsky and Clarke Wilm. Oh, the memories. Of course, everybody knows how the St. Louis story ended. After being released by the Flames in 2000 by general manager Craig Button, he signed on with Tampa Bay and turned into an NHL star that played until age 40. His totals after leaving Calgary included over 1,000 games and over 1,000 points between the Lightning and the New York Rangers. Now don't get me wrong, I'm not predicting Granlund is going to have the same prolific NHL career as St. Louis. That's not my point at all. But I will suggest there is great similarity to how their careers have begun in the Flames organization and the puzzling variance in usage between the minors and the NHL. For a fleeting moment, Thursday's practice in the desert to be precise, it looked like this time was going to be different for Granlund. Finally, it looked like his planned role and usage would better fit the skill set of the 22-year-old, who has shown time and time again that he's an elite player in the AHL and led Stockton in scoring with nine points (5 goals, 4 assists) when he got called up. At that practice two days ago, Granlund had Jiri Hudler on his wing and Joe Colborne on the other. This was a refreshingly new look from coach Bob Hartley. While the veteran Czech is not having as good of a season as he enjoyed a year ago, Hudler is still tied for third on the team in scoring with 14 points (4 goals, 10 assists) and is a far more talented and offensively-gifted player than Granlund has played with recently in Calgary. As an example, Granlund's previous six NHL games had come with Brandon Bollig as his left winger. In five of those games, Josh Jooris was on the right side. Neither are guys known for their offensive panache. But come Friday, we never saw it. The experiment ended before it began. It sure seemed like a pretty good idea at the time but overnight, Hartley changed his mind and on Friday, Hudler was back on the top line and Granlund was dropped to the fourth line. The second-lowest scoring team in the Western Conference then went out and scored only one goal in losing 2-1 in overtime to the Arizona Coyotes, to fall to 0-1-1 on their three-game road trip. Granlund, who centered Micheal Ferland and Jooris, played just 6:14. Not a lot of silk mitts in that group. Over that span, Granlund has been deployed pretty much exclusively as the club's fourth line centre. He's averaged just over 10 minutes of ice time, collected only six points (3 goals, 3 assists) and mustered only 27 shots, barely one shot per game. Granlund on the fourth line just isn't a fit when you consider how he has been deployed in the minors. At Stockton this season, like in Adirondack in 2014-15 and in Abbotsford the season before, Granlund has generally been the team's No. 1 centre. Over the past two weeks, Granlund had centred Kenny Agostino and Garnet Hathaway on the Heat's top line and they've been good together. In the last five games, Granlund had five points (3 goals, 2 assists) and rung up 23 shots on goal, an average of 4.6 shots per game. That's over four times as many shots on goal as he's put on target over his last few stints in the NHL. Upon his recall, general manager Brad Treliving referred to Granlund as Stockton's most consistent player. It begs the question, when are we going to see them let this horse gallop at the NHL level and see what he can do. Or, will we? It seems like now would be a pretty good time. The Flames woke up today in 29th spot in the NHL's overall standings. Only the Edmonton Oilers have been worse. They could use more scoring and they drastically need to improve their 30th ranked penalty killing and 29th ranked power play. Both of which are areas in which Granlund, Calgary's second round pick in 2011, could have an impact. With this team still rebuilding -- don't kid yourself, the first two months has been a stiff reminder of that -- this should be the time for a young, highly-touted player like Granlund to get an opportunity to play. Give him the chance to secure a full-time spot in the line-up and establish himself as part of the club's future. This is the time to set him up for success by trying him in a role that caters to his abilities. 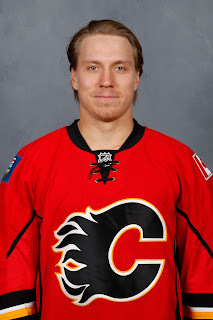 In case you don't remember, Granlund actually had played with Hudler before but only briefly. In a stretch that began on December 22 last season with the Flames dramatic comeback victory over the Kings that snapped that eight-game winless streak, it was Granlund that centred Hudler and Johnny Gaudreau that night. That unit stayed together for four games with Calgary winning all four. Included was this slick tic-tac-toe passing play against the Kings on December 29 that went Gaudreau to Hudler to Granlund, who neatly finished it off for a highlight reel goal. Granlund may never amount to anything more than a AAAA player. To steal a term from baseball, that's the description for a player that tears up AAA when they're in the minor leagues but just can't seem to get it done in the big leagues. Too good for one level, not good enough for the other. Granlund is very much a guy stuck in-between at the moment. However, he's certainly not going to realize his potential when he's getting a dozen shifts a night and being played with players that can't match his skill. Ferland and Jooris, his wingers on Friday, they bring energy but have a combined five points (2 goals, 3 assists) this season in 34 games. 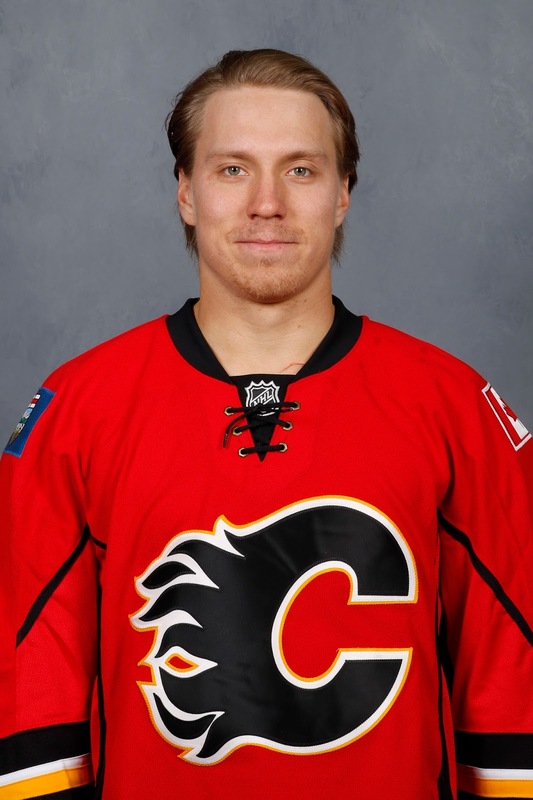 At some point, Calgary needs to make a determination on what Granlund is. Is he part of the future or is he a trade asset? Before making such a determination, it would be incumbent upon the coach to put him in a position to succeed. This way, if you move on from the player, at least you do so having done your due diligence. At least then, you move on with no regrets. Otherwise, you run the risk of seeing him flourish elsewhere and fans in this city old enough to remember the the late 90s are all too familiar with how that could end up turning out. For Joni Ortio, it was a fitting exclamation mark to a truly terrible 48 hours. In Stockton on Friday night in Ortio's first start after going unclaimed on waivers and being demoted by the Calgary Flames, the 24-year-old got lit up for four goals on 12 shots and got yanked just 13:07 into the Heat's game against Bakersfield. Now, some rust was certainly expected. Friday was the four-week anniversary of Ortio's last game action. However, it certainly wasn't the type of performance that left the 29 NHL general managers that passed on him feeling any regrets. Thursday was a very different day for Ortio. In a season in which -- as Tom Petty put it -- waiting has been the hardest part -- waiting to dress for a game, waiting to make that first start, waiting for a chance to play again, the Flames goaltender had to persevere another 24 hours of intense waiting, this time wondering if another NHL team would claim him after Calgary put Ortio on waivers. As it turns out, no team did and the Flames immediately assigned Ortio to Stockton. Dress it up however you want, going unclaimed on waivers sends a very loud message about where Ortio's stock is at and what teams think the odds are that one day he'll develop into a full-time NHL goaltender. Yet all 29 teams passed on him. There he was, available for free. Ortio was that couch at the end of the driveway with the sign on it, 'Free - Help Yourself', and nobody bothered. 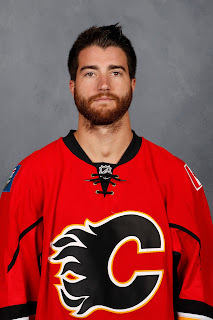 There was a lot of debate swirling this week around Ortio and whether or not he got a fair chance in Calgary. One could certainly argue he did not. But the fact no other NHL team took him is an indicting indication that the Flames are not alone in their assessment that Ortio is just not good enough to play in the NHL right now and may never be. Sure, for some teams there were obstacles that would have made it tricky for them to claim him. For one, they would have to keep him in the NHL so they needed a roster spot. Secondly and this will not come as breaking news in this city, there is a natural aversion to having three goaltenders. That said, if Ortio is, indeed, a rising star loaded with untapped potential, who is on the verge of breaking through at the NHL level, surely at least one team would have done what they needed to do in order to put a claim in for him. Yet not one team did. That couch? Still there at the end of the driveway. Ortio did have that great run of four straight wins on the road last January before losing (like a dozen Flames goalies before him) in Anaheim, games in which other NHL organizations would have had scouts at, games in which any team has access to viewing on video. Yet no one touched him on Thursday. Clearly the perception across the league is there isn't as much potential with this goaltender as many of us thought back in the summer. I declared on Wednesday when Ortio was put on waivers that his time in Calgary was done. It was a strong statement, for sure. Too strong? Perhaps. But when a team tells a goalie that they're willing to lose them for nothing and puts him on waivers, that says a lot. Two hurdles need to be crossed before Ortio gets another shot in Calgary. An injury or a trade need to happen at the NHL level as the Flames are poised to move forward with the veteran tandem of Karri Ramo and Jonas Hiller. Ortio needs to string together a really impressive body of work in the AHL to restore confidence in Bob Hartley so the Flames coach would be comfortable starting him again. Last night was not a step in the right direction. It would not surprise me at all to see Ortio remain in Stockton the remainder of the season. Come season's end and already looking at the probable departure of unrestricted free agents Ramo and Hiller, it's conceivable the Flames would be interested to keep Ortio -- a restricted free agent -- in the organization and try to re-sign him. However, perhaps the bigger and more pressing question is will Ortio be interested in re-signing in Calgary. Before heading for the airport on Thursday, Ortio was asked what his emotions were. As he skirted the question, it's safe to say he didn't say what he was really thinking. Put yourself in his position. Last contract negotiation, he fought for a one-way deal in year two of the two-year contract he signed. That was so he could get a shot this season at playing in the NHL. He made two starts -- game 9 and game 11. That's it. Two starts in seven weeks is probably not Ortio's definition of getting a shot. Add in speculation that Ortio refused to go on a conditioning stint, which is his right if the team asked and surely they did considering how long he had gone without playing, and you get the sense that Ortio is understandably not all that enamored with how he's been treated. So again, will he have a desire to return to Calgary given all he's gone through this season. While we can debate what Ortio's upside is and whether or not he'll re-sign with the Flames next year, one thing we can all agree on is he needs to play. The following weekend back with Adirondack, who had been eliminated from playoff contention, he played two of the team's final three games as they played out the string and got ready for summer. Fast forward to training camp and in addition to a relief appearance on September 21 (12 saves on 13 shots), Ortio got two starts. He shut out the Colorado Avalanche on 35 saves on September 24 and one week later stopped 23 of 26 shots in a loss in Winnipeg. That's five games, although none of them I would categorize as meaningful games. With the Flames goaltending and all-round defensive play in shambles and both Hiller and Ramo not getting it done, Ortio finally got a legitimate regular season start on October 26 in Brooklyn. It was his first start in nearly four weeks. He made 31 saves but lost 4-0 to the Islanders. A week later, he got back in against the Canadiens at the Saddledome and in what would be a lasting impression, he yielded six goals on 31 shots. He never played again. All total, last night was only Ortio's eighth start in a span of over nine months and just the third that you could classify as coming in a meaningful game. For a guy used to playing a lot, that's not nearly enough action to settle into any type of rhythm and give him even a remote chance at being the goalie some still think he could become. It's amazing to look back at how close Ortio might have been to this story unfolding completely different. Maybe. It was earlier this calendar year when the Flames called up Ortio and his hot streak began with that 36-save shutout in Vancouver on January 10. As Ortio kept it going and defeated the Coyotes, Sharks and Kings, at the time it sure looked like a defining time in his career. Some were thinking he might never go back to the minors. But of course, Anaheim happened -- he got pulled in the second period, and back he went to the AHL the very next day. We know Ortio isn't as good as he showed last January in that stellar run, but we also know he isn't as bad as he's shown this season with last night being a total write-off. The real truth is somewhere in the middle, the question is where. There is a lot of season left for Ortio to make a statement that the needle is a lot closer to what he demonstrated in the NHL in January, but to prove that, he'll have to be much better than he was last night. The good news is at least this time, he won't have to wait four weeks for another chance. With Jon Gillies and Kevin Poulin both injured, the Stockton net is Ortio's and his shot at redemption will begin tonight when the Heat meet Bakersfield again. You hope the kid bounces his back and turns his career around. But at this point, he sure has a lot to prove. Disneyland may be the happiest place on earth, but just a 12-minute drive away is the most depressing place on earth for the Calgary Flames. Of course, we're talking about Honda Centre, home arena for the Anaheim Ducks. In a stretch that goes back to when it was the Mighty Ducks of Anaheim playing out of the Arrowhead Pond, Calgary hasn't won a regular season game in that building since January 19, 2004. This 20-game (0-15-5) winless streak has been talked about ad nauseam in recent years but until the Flames snap this woeful drought, that isn't going to change. 4,327 - Number of days since that last regular season victory. In a 5-1 win, Craig Conroy had his only career four-assist game and Calgary got goals from Chris Clark, Martin Gelinas, Josh Green (one of two career goals for the Flames), Toni Lydman and Oleg Saprykin. In net, Roman Turek (36 saves) got the win. Interestingly, Jarome Iginla did not play due to an ankle injury -- the only game he would miss that season -- and Miikka Kiprusoff (knee) was also not in the lineup. 514 - The number of seconds of regular season hockey Tuesday's starting goaltender Karri Ramo has played at the Honda Center as a member of the Flames. That 8:34 came on November 29, 2013, when he mopped up late in the third period for Reto Berra, stopping all four shots he faced in a 5-2 loss. In other words, for Ramo it's a case of jinx? What jinx? 259 - New episodes of The Simpsons that have aired since that last regular season win. 178 - Regular season road wins for Calgary since last winning in Anaheim. That includes 21 victories in Edmonton's Rexall Place. Rounding out the Flames top three road buildings to play in during this stretch is Colorado's Pepsi Center (15) and Minnesota's Xcel Energy Center (14). 162 - Regular season home losses for Anaheim since Calgary last beat them. San Jose leads the way with 16 wins at the Honda Center over that span. Next on the list is Dallas (15), Los Angeles (12), Arizona/Phoenix (12), Vancouver (11), Columbus (10), Edmonton (9) and Minnesota (8). Yes, you're reading that correct. Despite missing the playoffs 10 out of 11 seasons over that span, the Oilers have still won nine times in Anaheim since Calgary last won there. 121 - Seconds away from snapping the skid on March 20, 2011. Instead, with Rene Bourque in the penalty box for interference, Teemu Selanne scores on the power play to tie the game. Corey Perry's overtime goal gives Anaheim a 5-4 win. 116 - Flames players that have played at least one game during this 20-game winless streak. Jarome Iginla leads the way with 16 games. He is followed by Mark Giordano (14), Robyn Regehr (11), Kiprusoff (10), Curtis Glencross (10), Dion Phaneuf (10), Cory Sarich (10) and Daymond Langkow (10). In terms of active Flames, behind Giordano are Lance Bouma (7), TJ Brodie (7), Matt Stajan (6), Mikael Backlund (6) and Jiri Hudler (5). That number includes 13 goaltenders. In addition to Kiprusoff, Calgary has tried Curtis Joseph, Henrik Karlsson and Jonas Hiller twice each. Also appearing in net have been Brian Boucher, Curtis McElhinney, Jamie McLennan, Joey MacDonald, Joni Ortio, Ramo, Leland Irving, Berra and Turek. 111 - Songs recorded by Taylor Swift (per Wikipedia) since the Flames last regular season win in Anaheim. There should be plenty of Bad Blood by now so maybe tonight is The Lucky One and Calgary can Shake it Off and pick up a win, which would be the realization of fans' Wildest Dreams. 80 - Shots faced by Ramo in his two starts in Anaheim in the 2015 playoffs (games 2, 5). He lost both games but made 75 saves for an impressive .938 save percentage. Ramo also came on in relief of Hiller early in the second period of game 1 and stopped 18 of 21. Altogether, his three post-season appearances at the Honda Center add up to a .921 save percentage. 46 - Seconds remaining in a tie game on March 2, 2012, when Ryan Getzlaf scores on a set-up from Perry to win it 3-2. Irving finishes with 35 saves. 30 - Number of regular season games Calgary has played in Anaheim since a 2-1 Flames win on January 13, 1999. During that stretch, their record is 1-19-10. 29 - Number of saves made by Ramo when he won 4-3 in Anaheim on January 9, 2009 in his only career regular season start at the Honda Center. He was 22 years old at the time and was playing for the Tampa Bay Lightning. 22 - Wins for the Flames in California since last winning in Anaheim. That number is made up of 13 victories in Los Angeles and nine in San Jose. 13 - Number of Flames-Ducks games in Anaheim -- dating back to 1993 when the Ducks entered the NHL -- that have gone to overtime. Calgary has yet to win in extra time. Not once. They've lost three games in a shootout, lost four in overtime and six games that came before the advent of the shootout ended in a tie. 8 - Number of shooters for each team in a 3-2 shootout loss in Anaheim on February 6, 2012. Perry and Olli Jokinen were the lone goal scorers after three shooters. Next, Getzlaf and Iginla both missed. In round 5, Bobby Ryan and Blair Jones both scored. Next, Jason Blake and Krys Kolanos both were unsuccessful. Shooting seventh, Cam Fowler and Brodie were both stopped. As shooter No. 8, Niklas Hagman beat Kiprusoff to put the pressure on Calgary and Backlund was stopped by Hiller to end it. Ducks win. 7 - The age of Sam Bennett when Calgary last won a regular season game in Anaheim. He would have been playing tyke hockey for York Simcoe in Ontario. 6 - Number of playoff games the Ducks and Flames have played in Anaheim since 2004. Calgary has lost the last five but did pick up a 5-2 win on April 25, 2006, making that the last time -- post-season included -- they tasted victory in Anaheim. Scoring that night were Kristian Huselius, Chuck Kobasew, Daymond Langkow, Darren McCarty and Robyn Regehr. It was game three of their first round playoff series and the victory put Calgary ahead 2-1 in a series they'd eventually lose in seven games. 4 - Number of James Bond movies that have been released since the Flames last win in Anaheim. 3 - Number of players expected to be in the Flames line-up Tuesday that have yet to lose (or play) a regular season game in Anaheim while playing for Calgary. New to the nightmare are Dougie Hamilton, Michael Frolik and Bennett. 2 - Number of players in uniform for the Mighty Ducks in that last Calgary win, who are still playing in the NHL today -- Joffrey Lupul and Chris Kunitz. As well, Flames defenceman Andrew Ference is still going. 1 - Number of wins it will take to end this madness. This is the first of three visits to Anaheim in 2015-16. The Flames also play at the Honda Center on February 21 and March 30. Surely the end is near and for the benefit of dead horses and beating them further, we can only hope. Thanks to their best all-round game of the season and capped off by a highlight reel individual effort from Johnny Gaudreau, Calgary reached the quarter-point in the NHL season in style on Friday with a statement win over the defending Stanley Cup champions. For a full recap of what shook down in the Flames dramatic 2-1 overtime victory over the Chicago Blackhawks, including reaction from both dressing rooms, here's my game story for The Canadian Press. Meanwhile, as Calgary (8-12-1) enters a stretch of three days between games just four points out of a playoff spot, here are eight reasons Flames fans should be feeling good about what lies in store for the remaining three-quarters of the season. Friday was as solid of an effort as we've seen from Calgary all year. The numbers don't lie. The Flames outshot the visitors 37-19 on the night and at even-strength, it was more one-sided at 37-14. It was the first time in nearly two years Chicago had been held to less than 20 shots. The last time was Dec. 5, 2013 in Minnesota when the Blackhawks were outshot 23-19 in a 4-3 loss. In fact, it was just the third time in the last seven seasons Chicago had been kept to less than 20 shots while giving up 35 or more. Flames fans will definitely remember the last time it happened too. The date was February 2, 2013. It was a couple weeks into the lockout-shortened 2012-13 season and that night's game at the Saddledome was the nationally televised late game on Hockey Night in Canada. After Jay Bouwmeester gave Calgary a 2-1 lead with 35 seconds left in the third period, Marian Hossa stunned the home crowd, scoring on Miikka Kiprusoff at 19:57 to tie it. In the shootout, Patrick Kane was the lone player to score and the Blackhawks, despite being outshot 47-19, improved to 7-0-2. It would end up being the close st to a regulation loss as they would come in the first half of the season as they started off 21-0-3. What more can you say about the uber talented Johnny Gaudreau, who leads the Flames with 20 points. It was just last weekend that we were marvelling over the 22-year-old's first 100 games and how his 82 points compared to others in Flames history as well as other current NHL stars. Well, the next 100 games has gotten off to a fine start with three points in games No. 101 and No. 102. So far this season, Gaudreau has been in on 40 percent of Calgary's 50 goals, which if the season ended today would be the third-highest percentage in team history behind Jarome Iginla (47.8 percent in 2001-02, 43.4 percent in 2007-08). And seriously, how good is this guy when it comes to overtime. "At three-on-three, Johnny is the toughest player to play against because there's so much room and he has so much speed and he never seems to get tired," said Karri Ramo last night. "If you give that many chances to us, especially that guy, at some point it has to go in. He's a tremendous hockey player." With two goals and four points, Gaudreau leads the league in overtime scoring. Tied for 15th in the NHL's overall scoring, Gaudreau climbs fourth if you filter that list down to just rookies and sophomores. I wouldn't be surprised if he ends up on top of such a list by season's end. Another positive from last night's game was the return of the old Mark Giordano. Making strong plays in his own end to win puck battles, making smart decisions with the puck, and bursting up ice to join the rush when opportunity knocked. It was the kind of two-way game we got accustomed to watching on a nightly basis from the Flames captain the last couple years but has only been on display in spurts this season. Mind you, he still wasn't the team's best defenceman. That distinction belonged to TJ Brodie and what more can you say about the 25-year-old, who eclipsed 30 minutes in ice time for just the second time in his career. His 31:43 -- over half of the game -- was the most ice time in a game since he logged 35:42 the night of the famous brawl in Vancouver two seasons ago. In this feature I wrote earlier this week in which I chronicled the steps in Brodie's journey from nearly going undrafted to being one of the most dynamic defencemen in the NHL, he talked about how his Dad and longtime minor hockey coach wouldn't let him play forward. So, he decided he'd simply play defence and join the rush all the time. The rest is history. Against Chicago, you saw that dynamic presence from him once again. He was nearly sprung free on a breakaway in the second period. On another sequence while possessing the puck deep in the Chicago end, Brodie made this smooth behind-the-back bank pass to himself to evade a defenceman, doing so about as casually as you can imagine. If he's still a secret around the rest of the league, he won't be for much longer. Home cooking had tasted pretty awful to start the season. Calgary lost its first four games at home before beating Detroit 3-2 in overtime on Oct. 23. Then they went and got pounded by Montreal 6-2. Since that embarrassing debacle that included hats raining down on the ice for Dale Weise's hat-trick, the Flames have been heating up at the Scotiabank Saddledome having rattled off four straight victories -- Philadelphia, Pittsburgh, New Jersey and now Chicago. After this upcoming three-game trek through the Pacific, the Flames return home for two full weeks. They'll begin December with a five-game homestand in which they take on Dallas, Boston, San Jose, Buffalo and the New York Rangers. In that game on Dec. 1 against the Stars, Calgary will be looking to making it five straight regular season victories at home for the first time since a five-game streak from Jan. 22 to Feb. 1, 2014. Normally, a .901 save percentage is pretty bad. In fact, it ranks Karri Ramo 39th among 46 NHL goalies. But this has very much been a what-have-you-done-for-me-lately type of season and if you're Ramo, you take it considering the frightening depths that save percentage has been. At an ugly .868 when October ended, a .914 save percentage for November has helped Ramo inch above the .900 mark for the first time this year. Lately, the 29-year-old Finn has been especially good, posting a .930 over his past four games and a .921 over his last eight. Against Chicago, he wasn't overly busy but he was still tested and with no wiggle room for error, had to come up with some big stops. There wasn't one any better than this spectacular desperation save off Marcus Kruger in the first period. It's a no-brainer Ramo will be back in net Tuesday in Anaheim and with another couple days off after that, it wouldn't surprise me if he ends up playing both ends of the Friday-Saturday back-to-back in Arizona and San Jose. While there is question marks about what will happen when Jonas Hiller returns, specifically in respect to Joni Ortio, Ramo's strong play has effectively removed him from that debate. While it was an impressive performance against the Stanley Cup champions, piling up the first 10 shots of the third before the Blackhawks got their first 11:30 into the period, it was just the latest in a string of much better efforts lately. November 17 - A 3-2 win over New Jersey, who had won four of five and had been 10-3-1 in their previous 14. November 13 - A 3-2 win in Washington, who had won five of seven and had been 10-3-0 in their previous 13. November 7 - A 5-2 win over Pittsburgh, who had won six in a row and had been 9-1-0 in their previous 10. In addition, they played well in Tampa Bay only to lose on a late power play goal. You could argue they hung in OK against the Blackhawks on Sunday with Chicago getting all three of its goals (excluding the empty netter) in a span of less than two minutes in the second period. Also worth pointing out is the Flames schedule so far has been one of the more difficult ones in the NHL. Despite that, they have five wins in their last eight and with some puck luck, that could have been six or seven victories, Calgary has found another gear and is playing more like the team everyone expected back in September. Last season, only six teams scored first less often than the Flames, who did it only 36 times. This season, Calgary has opened the scoring 13 times, which ties them for the lead with Montreal, Dallas, Chicago and Detroit. As you can see, the Flames winning percentage is the worst of that bunch, but playing from ahead is always better than playing from behind and it will pay dividends if that quick start trend continues. Last year, the Flames had a .694 winning percentage when scoring first (25-8-3) so expect this year's percentage to keep moving in that direction and that will result in some big points along the way. Seven games in a row now, coach Bob Hartley has rolled out the identical top nine forwards. Well, sort of. Last night, Mason Raymond took the spot of an ill Jiri Hudler (ill) on the top unit. It's been a topic of conversation the past week and the players have been saying it's not a coincidence that the team's improved play has coincided with Hartley getting away from the old line blender that was running at high speed the first month. The result of this stability has been more team cohesion with each line taking turns being the contributors offensively. The top line of Gaudreau-Monahan-Hudler has not been what it was the last couple months of last season by any means but it hasn't been bad either and they're still contributing some important goals. Sean Monahan is now up to seven goals, which puts him on a pace for 28. The Bennett-Backlund-Frolik trio had been red hot but have cooled off lately but any slack has been picked up by the Colborne-Stajan-Jones trio that has been very good the last couple weeks. Even the fourth line has been playing very effective minutes lately with Micheal Ferland, Brandon Bollig, Josh Jooris and Derek Grant -- before being returned to the AHL -- all playing a similar style of game. What's been working for the fourth line has been playing an identical style every time they're on the ice -- heavy and/or aggressive forecheck, funnelling pucks to the net and then crashing the crease, and just bringing energy and a different tempo to the game when they get on the ice. While the in-or-out playoff discussion has been swirling around already, the reality is the divisional games are going to have a huge influence on who makes it and who doesn't in the Pacific Division and that portion of the schedule is just now getting going. Until now, two games with Vancouver and two with Edmonton is all there's been and Calgary has gone 2-2-0. Last year, the Flames made the playoffs thanks to a 22-6-1 record in divisional games. It's not a necessity that they duplicate that mark this year but after the bad first month, the onus is on them to make up ground by winning a majority of their divisional match-ups. Next up is Anaheim and the Honda Centre isn't looking nearly as intimidating as it has in the past. The Ducks finished off a road trip in Tampa Bay Saturday and got whipped 5-0. They return home to host Calgary on Tuesday. Last homestand, the Ducks failed to win going 0-1-2 with losses to Arizona, Edmonton and the New York Islanders. Earlier in the season, Vancouver, Arizona (yes, they've won in Anaheim twice this year) and Colorado took two points out of Anaheim. The Flames are winless in their last 20 trips to Anahaim (0-15-5) dating back to 2004 and have just one win in their last 30 going back to 1999. Yet, Calgary should head there with some swagger next week and after predicting prior to the season in my Eight Bold Predictions that the Flames would win twice in Anaheim in their three visits, I'm not backing down now. Calgary also plays in Anaheim on February 21 and March 30. 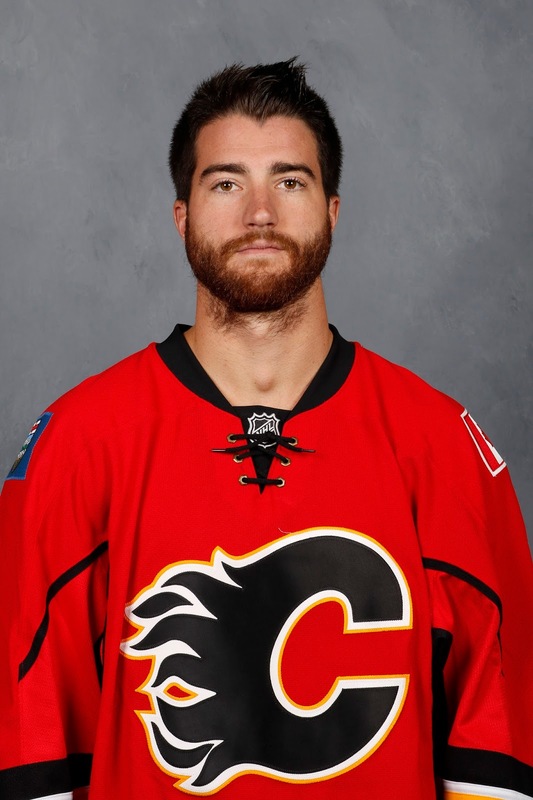 I would love to know how many miles TJ Brodie skates in a game. Frequently racing up ice to join the rush, often leading that rush, he may be a defenceman by trade -- and a solid defender at that -- but it's his explosive two-way game that has turned him into one of the most exciting blueliners in the NHL. While it's Hartley's system that not only allows but encourages Brodie to activate all the time, it's Brodie's underrated skill-set -- tremendous speed, smart instincts, smooth puck-handler -- that has enabled him to thrive in that environment. "Three-on-three down low, team systems are so good now that unless there's a mistake, you're not going to generate anything," said Hartley. "You need that fourth man to create confusion, to come in from the wide side using a little delay play. That's why those guys are so good. You look at Brod's first goal, his speed and hockey sense allows us to do this." During my chat with Thomas James, better known as TJ, he reflected on his pro career to date and how he went from being a guy that was on the bubble when it came to being drafted to one of the NHL's rising stars. Don't let the fact he's third on the Flames blue-line payroll fool you, just 20 games into a five-year/$23.3 million contract extension, he has already established himself as arguably the best of the bunch. The draft year for the native of Chatham, Ontario was 2008. When NHL Central Scouting released its midterm rankings, Brodie was No. 164 among North American skaters. In the final rankings, he climbed 10 spots to No. 154 but that still came with no assurances he would hear his name called given 211 players were to be selected and North American goalies as well as international skaters and goalies all had to be factored into the mix. At the stubborn insistence of former Flames director of amateur scouting Mike Sands, Calgary general manager Darryl Sutter selected Brodie in the fourth round, 114th overall. Unique about that particular draft class was how rich it was for defencemen. It's generally regarded as the deepest draft ever for that position. The next four picks after Steven Stamkos went first overall, all patrol the blue-line -- Drew Doughty, Zach Bogosian, Alex Pietrangelo and Luke Schenn. 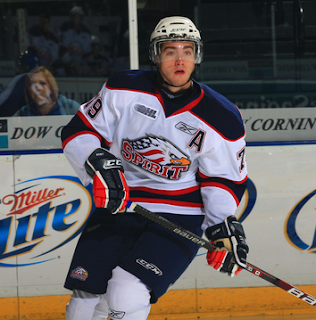 Brodie saw plenty of the first three as they also played in the OHL. Brodie's offensive statistics kept improving over his four seasons with Saginaw. It was during his fourth season that he was acquired by the Barrie Colts, who were loading up for a Memorial Cup chase. Going to a deeper team, which had also acquired Pietrangelo in a trade, the ice time came down slightly and so did the points per game with 33 pts in 46 games (0.72 PPG) but what Brodie got out of it was an extended playoff run. Partnered on the blue-line with Dalton Prout, who now toils in the NHL for Columbus, the Colts rolled through their first three playoff series losing only one game before being whipped in four straight games by Taylor Hall, Adam Henrique, Greg Nemisz and the Windsor Spitfires in the league final. Brodie's first taste of the NHL came quicker than he thought. Much quicker. 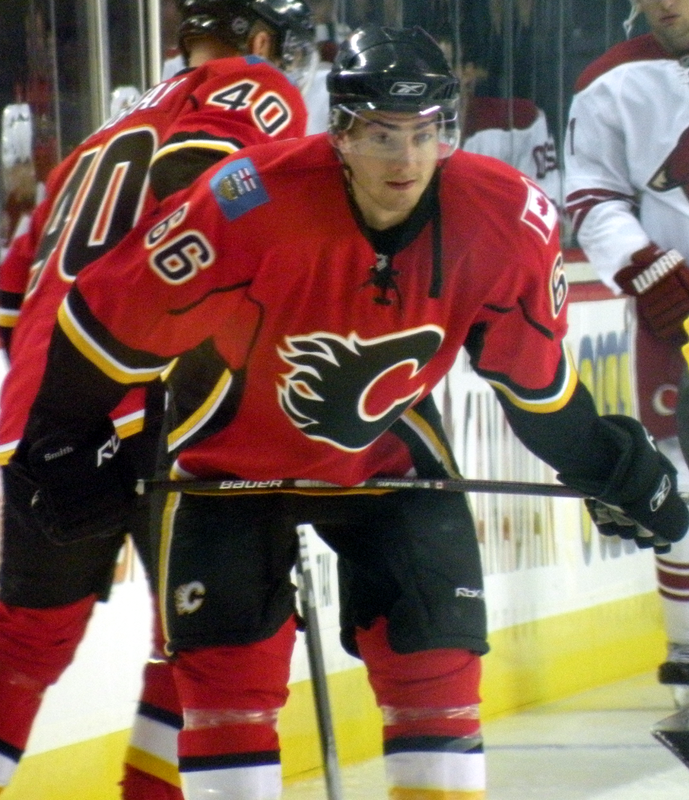 Thanks to a strong training camp in 2010-11 in which he scored four goals to help Calgary go a perfect 7-0-0 in the preseason, the 20-year-old made the Flames season-opening roster. Still wearing his training camp number, he dressed for their first three games wearing jersey No. 66. After partnering with Adam Pardy for the first two games, he ended up alongside veteran Steve Staios in game three. But it was not a great night for the two of them. In a 3-0 home-ice loss to Florida, Staios was a minus-3 and Brodie was a minus-2. 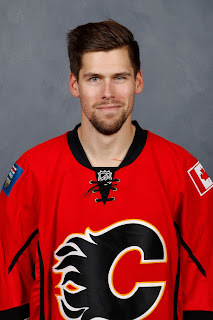 With veteran Cory Sarich on the roster and available, Calgary sent Brodie down to the club's AHL affiliate in Abbotsford on what would turn out to be a one-way ticket as he remained there the rest of the season. Brodie's first and only full season in the AHL was a good one. 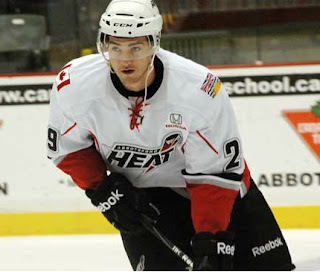 He finished second on the team in scoring with 34 points (5 goals, 29 assists) and represented the Heat at the AHL all-star game. “It's never fun going down but I think it made me a lot better player," said Brodie. "Going down and getting the ice time, getting put in all situations, giving me a chance to work on the defensive side that I never really was taught in junior and growing up." The area of his game Brodie admitted he needed to strengthen was that defensive side. He acknowledged that it wasn't until he left junior that he fully appreciated that aspect of it. Brodie opened up the 2011-12 season in Abbotsford but was recalled in November and spent the rest of the season in Calgary playing 54 games and picking up 14 points (2 goals, 12 assists). Then came the NHL lock-out so back to the AHL went Brodie for some more seasoning. Feeling more comfortable in his own end at that point, he used that final stint to get back to the same dynamic playing style that has become his staple. He put up 20 points (1 goal, 19 assists) in 35 games before being recalled as soon as the work stoppage was over. “My first year down there, I really concentrated on the defensive side. I didn't jump up into the play too much," Brodie said. "But once I learned how to play in my own end, I got back to jumping up into the play offensively like I did in junior but at the same time, play smart defensively." 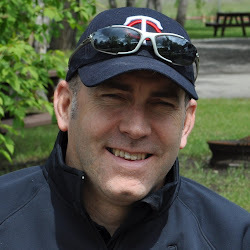 It was a dubious start to the lockout-shortened 2013 NHL season for Brodie as he watched the season opener from the press box with Derek Smith drawing into the line-up and and playing on the third pairing with Sarich. The Flames top four were Jay Bouwmeester and Mark Giordano, and Dennis Wideman and Chris Butler. “You never want to be a healthy scratch. It's definitely something that makes you want to work that much harder to get back in the line-up and prove that you should be in the line-up,” said Brodie, who sat out just that one game and has been a fixture ever since. Brodie's arrival on the big stage came when Bouwmeester was traded to the St. Louis Blues at the April 1 trade deadline. That left a huge void in terms of ice time and responsibility and Brodie took full advantage of both. To start the 2013-14 season, Brodie partnered up with Giordano and they have formed one of the NHL's top duos ever since. Asked what has been the single most important part of his development as a hockey player, Brodie says it's all about getting ice time. He says that's vital when you're a young player and it's how you get better. “It's been baby steps the whole way but the biggest thing for me no matter where I was, I was always getting ice time," he says. "Going back to my first year after being drafted into the OHL. I played junior B, which was an affiliate for the OHL. That gave me a chance to get the ice time and experience." “Same thing my first year of pro. Playing back in the A gave me a chance to get the ice time. Those things are big in development. If guys aren't playing, it's tough to get better. You have to be on the ice." He's certainly on the ice plenty now. In fact, he barely seems to leave it most nights. Playing in the best hockey league in the world, he's averaging 24:44 per game to lead the team. That ranks 11th in the NHL. As for his importance to this hockey club, so often you don't know how valuable someone is until they're not there. Calgary was 2-7-0 without Brodie when he missed the start of the season with a broken hand. Since he's returned, the team has started to turn things around having gone 5-5-1. If No. 7 can stay healthy the rest of the way, the Flames playoff hopes are still very much alive. Yes folks, he's that good. Talented Flames left winger Johnny Gaudreau played his 100th NHL game Sunday night when Calgary wrapped up a four-game road trip with a 4-1 loss in Chicago. For his career, Gaudreau has 82 points (29 goals, 53 assists). To put what the 22-year-old has accomplished in perspective, he is the first Flames player in over 20 years to hit the 100-game mark and have more than 60 points, never mind 80. Jarome Iginla and Dion Phaneuf, who each had 60 points exactly at this same juncture in their career, are the only two players from the past 20 years to make the list of the 20 most productive first 100 NHL games in Calgary Flames history. Given the lack of impact young players to come up through the system recently for Calgary, it should come as no surprise that Gaudreau's first 100 games have been considerably better than anyone else on the current roster. Only Sean Monahan is remotely close, although Sam Bennett could give Gaudreau a run for his money. Should he stay healthy, Bennett will hit 100 games in November 2016. Through 19 games, Bennett's 12 points is one back of the 13 that Gaudreau has accumulated after the same number of games. Curious to see how Gaudreau's first 100 games stacked up against various players from around the NHL, I rolled up my sleeves and got down to some serious research. As it turns out, Gaudreau's start has been pretty darn good and he ranks inside the top 10 of all active players. Of course, a factor to take into consideration is Gaudreau's first NHL season came at age 21, which is two or three years older than many of the players on the following list. Nonetheless, it's interesting to see where he's at compared to other notable NHL stars. In his draft class, Gaudreau currently ranks 12th in points but is rising fast. Since he went to Boston College for three seasons, he was later to the NHL than many. For some context, Gaudreau is on the cusp of 100 NHL games while second overall pick Gabriel Landeskog will play his 300th NHL game this week for Colorado. To level the playing field, the better way to rank the players would be points-per-game and when you slice the numbers that way, Gaudreau slots in at No. 1 with a considerable cushion over first overall pick Ryan Nugent-Hopkins. 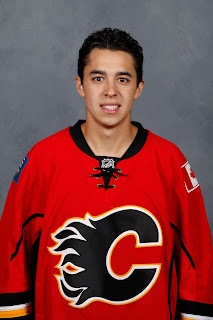 No disrespect to Theoren Fleury or Kent Nilsson but for my money, Gaudreau has already established himself as the most exciting player to ever play for Calgary. He's not the best player of the last 35 years. He may eventually work himself into that conversation some day but that's many, many years away. But in terms of creativity and wizardry with the puck, an ability to turn nothing into something, I haven't seen someone better. While the 'Magic Man' was pretty fun to watch back in the early 80s, Gaudreau's ability to dominate in a completely different era of the NHL where the defence are faster, bigger and stronger and it's so much more difficult to score goals, doing what he does every night takes a very special talent. Enjoy him Calgary, these kinds of players don't come around very often.